Gentleman Auction House's Virtual Tag-A-Long: Who Wore It Best? Having never arrived on the red carpet to any sort of Hollywood awards show, I've never had the emotional backhand (I'm assuming, here) of realizing that I'm wearing the same dress as some other diva. Maybe some of you girls had the unfortunate high school experience of showing up to a dance with the same dress as some other skank (because if they have the same dress as you, they're a skank, right?). BUT, I think I get it, now. Due to recent circumstances, I think I know how it feels. 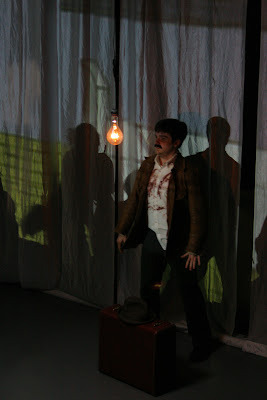 Last weekend we shot our music video (for "The Book of Matches"). I spent the few weeks prior organizing everything to make sure all elements were in place for this project. I arranged for the equipment, the location, the actors, the costumes, the props, etc., and footed (almost) the entire bill for the whole production, since I'll be using it to (finally) get my film production degree. It was a long and arduous process getting all of the elements in place, but with some help in key positions, it all fell into place and the shoot ended up going smoothly and without any serious complications. 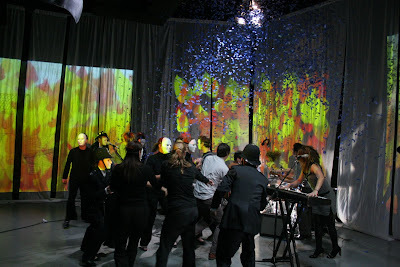 The general idea was this: Three different projector "screens" would paint the "backgrounds" of a few different scenes within the lyrical storyline. The band plays in front of the middle screen, and Eric narrates (sort of, by singing) the story that takes place around him, featuring a main character (played by Mr. Billy Schuh of Foundry Field Recordings), his children (played by Cat and Chris McMillan), and the town he lives in, that is accusing him of the murder of a handful of local teens. 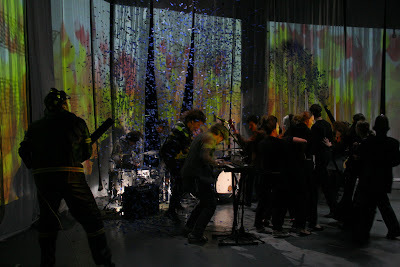 The action slides from screen to screen as the band plays and Eric moves into the foreground of each scene. 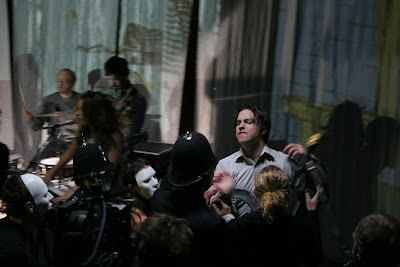 The entire video was one long steadicam shot, filmed on Super 16mm film. 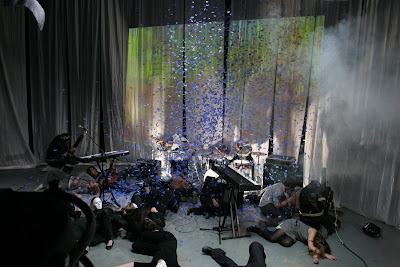 The "townspeople" are portrayed as an angry mob, donning all-black attire with white masks, and as the end of the song draws near, the town "burns" in the projection images, as two fireman (also masked) enter to try to extinguish the fire with confetti cannons filled with blue confetti - metaphorically mimicking fire hoses. So this leaves me/us with a predicament: Their video is done and out and on YouTube and available, whereas ours is a couple weeks away from any kind of premiere... In the words of the infinitely wise David Byrne, "How do I work this?" This is already my attempt at a psuedo-public disclaimer whereupon I state "I, Steve Kozel, did not intentionally rip off any elements of the Ludo video, and if I was going to, I probably would have included a couple other cool things that they did." How does this happen? It's soooooo bizarre. Can we chalk it up to regional influences? Does it sell better that way? 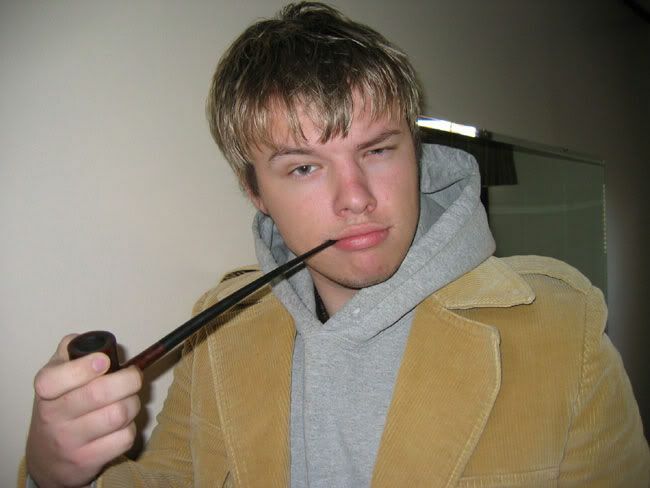 Should I arrange a sit-down with Ludo where we figure out some kind of video double-bill with MTV? Can they sue me? Who wore it better, and at this point, does it even matter? If they're on Island, does that automatically mean they win, and all I get to show for this is a diploma? Does it matter that the diploma is the least important aspect of this entire project? All questions aside, I hope to have a video to show you all in a couple weeks. Stay tuned. Let the people decide! give us the video! Totally. I want to see your video. I was a Ludo fan a few years ago, but if they're lame about this, I'll start calling them Lame-o, and their pride will never recover; they really look up to me. Also, if you'd really like to know how this happened, and have your fragile conceptions about the nature of our minds shattered forever, watch this video, which will give you the most plausible explanation you could ask for.